Entrepreneurs group Go Negosyo Kapatid and other organizations on Tuesday, July 25 turned over financial assistance to the families of 101 soldiers slain in the Marawi conflict as a show of gratitude for the heroes’ sacrifices. Each family received P1.25 million. Of the amount, P250,000 came from Go Negosyo Kapatid and other groups and the P1 million from an anonymous donor. “The events that have transpired in Marawi over the past weeks are truly heartbreaking. Many of our brave soldiers have laid down their lives in order to bring safety and peace amid the violence and struggle,” Go Negosyo founder and Presidential Adviser on Entrepreneurship Joey Concepcion said. “We want to honor these courageous souls by showing that their fellow countrymen – from the government to the business sector – have not forgotten about their ultimate sacrifice… their loved ones who miss them dearly,” Concepcion said. He said the private sector is committed to help the beneficiaries, not only by providing them with financial assistance, but also by guiding them in creating their livelihood. Business leaders who donated to the Marawi fund include Manny V. Pangilinan of the PLDT SMART Foundation, Tessie Sy-Coson of BDO and SM Group, Josephine Gotianun Yap of Filinvest, Jaime Zobel de Ayala of Ayala Corp., Alfred Ty of Metrobank Foundation, Jean Henri Lhuillier of Cebuana Lhuillier, Mildred Vitangcol of St. Peter’s Chapel, Alice Eduardo of Sta. Elena Corp., Federico Lopez of First Philippine Holdings, Michael Tan of Asia Brewery and Philippine Airlines, Tony Tan Caktiong of Jollibee Foods Corp., Injap Sia of Double Dragon Properties, Joey Concepcion of RFM Corp., Jojo Concepcion of Concepcion Industries, William Belo of Wilcon Depot, Dennis Uy of Chelsea Logistics, Santi Araneta of LBC and Sabin Aboitiz of Aboitiz Corp.
Other groups that provided assistance to the bereaved families were PLDT SMART Foundation, Federation of Filipino-Chinese Chamber of Commerce and Industry and the DU30 Cabinet Spouses Association. President Duterte, former President Gloria Arroyo, Cabinet officials and military and police officials witnessed the turnover ceremony at Malacañang. 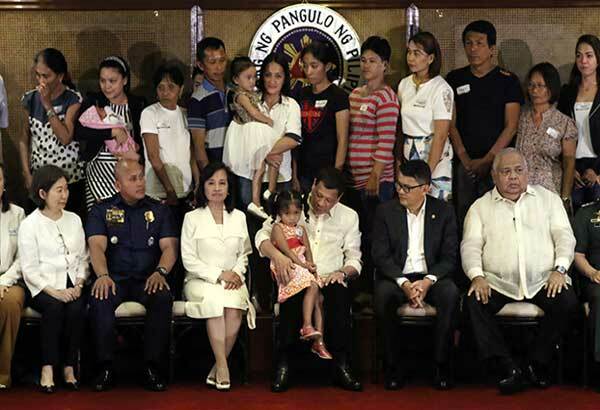 “Thank you for extending the much-needed support for the families of our fallen AFP and PNP troops,” President Duterte said. “My heart bleeds every time I read briefers and count the number of soldiers who died. I am the one suffering because I was the one who declared martial law and ordered our soldiers to go there to die,” he added.